The Brattleboro Women's Chorus was founded in the fall of 1996 by conductor Becky Graber, incorporated in the State of Vermont in January of 2002, and recognized as a 501(c)(3) in April of 2003. Since its founding, the chorus has changed somewhat every session, but has remained constant at 75-100 or so Brattleboro area women and girls. They sing together Wednesday nights or Thursday mornings and present two annual concert weekends. The chorus performs occasionally for special events in the Brattleboro area as well. The two sessions run from early September to mid-November and from early March to mid-May. New members are always welcome at the start of each session. There are no auditions or requirements other than being a female over the age of 10 and a love of singing. Financial aid is offered to make it possible for all local women to participate, and there are discounted rates for students and family members. The heart of the chorus experience is the music chosen by the director. She describes it as “spirited and spiritual” and “songs that are good to live with.” The inspiring and meaningful words and sounds float in heads all session and usually beyond. Often it is music from other cultures and choral traditions and is always a variety of genres. The words are universal themes of the soul in a human experience (click here to hear a sample of our music on our current CD or here to watch one of our concerts). The music is primarily taught aurally, that is, by ear. The side benefit of this is that singers don’t have to be able to read music to be able to participate. The larger benefit is that music is learned by listening, a useful skill for everyone to hone. Songs are learned internally, so that they last in the memory. Because the chorus can be led by the conductor without the distraction of looking at paper, concerts are presented with focus and feeling. Occasionally, sheet music is used, and always there are recordings of all parts to every song for learning music outside of the chorus rehearsal. The second heart of the chorus is its director, Becky Graber. She leads with the grace of skillful teaching plus endless patience, acceptance of all, and wonderful humor. She sets the tone of kindness, non-judgment, and openness, which trickles down and becomes how members treat one another. She works continually to improve the vocal skills of all members. Even though there is a wide range of musical experience among singers, the quality of the performances Becky is able to generate speaks of her effective teaching abilities. Read more about Becky here. 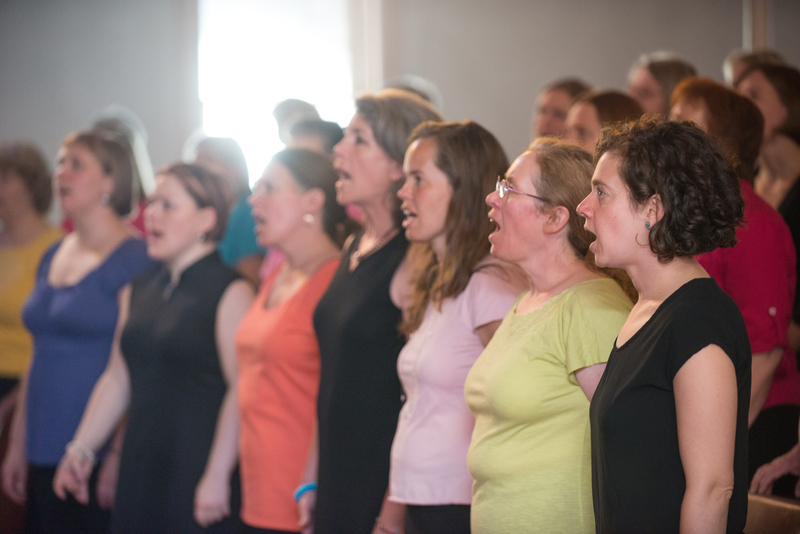 The chorus is a safe, welcoming community where women of varying ages, backgrounds, and musical experience can experience the joy of music while connecting with each other artistically, spiritually, and socially. Many have found this connection to be a resource of support during times of stress, both personal and in the world, and always a source of fun and friendships. Community is also established through chorus potlucks, end of season parties and occasional fundraisesrs that allow chorus members to bond outside of rehearsals. For many members, participation in BWC is a way of taking care of themselves. Chorus rehearsals are a structured time apart form the demands of ordinary life. 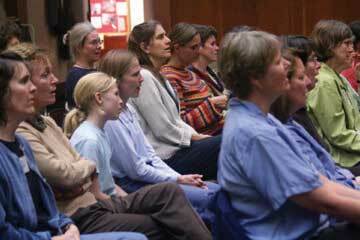 Singing provides a creative experience that many describe as meditative or spiritual.